No matter who you are – your gender, ethnicity, country of origin, or age – if you win something big, you will raise your arms in victory. Doesn’t matter who you are … your arms go up. It’s hardwired in you. Researchers studying the activities of blind Para-Olympians discovered the very same thing. They raise their arms, too. Even though most of these blind people had never seen anyone else do it, they instinctively raised their arms with joy upon winning a competition. The feeling of winning, it seems, is uniformly uniform. In other experiences, we’re individuals. The foods we like, the people we’re drawn to, what makes us laugh. We’re all a little different. When we win, we throw our arms in the air. So, on June 24, when University of Virginia pitcher Nathan Kirby soundly struck out Kyle Smith of Vanderbilt looking, ending the College World Series and bringing UVa their first-ever national baseball championship, Kirby did exactly what evolution told him to do. But, here’s the funny thing. I was sitting a thousand miles away from Omaha, watching on television. And, I raised my arms, too. You may wonder why it has taken me more than a month to tell you that UVa won the College World Series. I’m not sure I know the answer. I’ve never really had a team I follow win anything like this before, so I’m not sure how to throw my arms up in the air on a blog without sounding gloaty or pompous or just annoying. I don’t want to hurt anyone’s feelings. UVa wasn’t expected to win. Heck, they weren’t even expected to go to the post-season. They barely made it to their own ACC tournament and, frankly, they were awfully stinky once they got there. But, baseball is a funny game and on any given day a team can suddenly find the rhythm they’ve been missing all season. If you still don’t believe how improbable this was, just take a look at the tee-shirt that the NCAA had to hastily doctor to celebrate Virginia’s win. 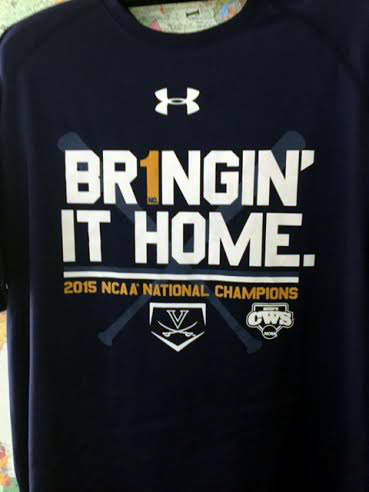 Yes, the UVa championship tee-shirt … features Vanderbilt gold. I know it was a month ago, but I still want to share three special moments from UVa’s post-season. Because, like throwing your arms in the air, these three moments are universally wonderful, regardless of whether you’re a UVa fan, or a college baseball fan, or any baseball fan (except, maybe, Vanderbilt’s). Check out Clement after the hit (at 1:41). Former UVa Hoo and current Oakland A reliever Sean Doolittle helpfully provides the part I’d like you to watch again. An exceptional display of victory arms, don’t you think? The smack-down? That’s junior Kevin Doherty. I believe this is a lesson for all of us. Throwing your arms in the air can feel really good if you’ve just won a trip to the College World Series. But, it puts you in a tough spot should a jubilant teammate wish to make you the flaky crust of a dogpile pie. UVa senior Kenny Towns has been “Old Reliable” down at third throughout his college career. When the Angels picked him late in the 20th round of the MLB draft this year, I thought, wow, they just got themselves a player that’s much, much better than any scout realizes. After the Series I had more people email, text, and mention this play to me than any other. And, they’re right. I love amazing plays in the hot corner. And, this one was nasty, hot, and sweet like when you tell the waiter you want your vindaloo “Indian hot” and he believes you. Baseball Prospectus determined that the first World Series dogpile – run, jump, fall into a heap – was done by the 1982 St. Louis Cardinals. Take a look … victory arms, dogpiling, fans swarming the field. Wait? Fans swarming the field? What kind of savages were we? Watch here. Prior to ’82, there was a lot of running, hugging, and weird, awkward jumping around. But, no dogpiles. Prior to 1962, most winning teams didn’t even stick around to hoot and holler. The game ended and they simply ran off the field to party in the clubhouse. So, celebratory dogpiles are younger than my little Metropolitan dumpling Bartolo Colon (look, I’ve mentioned him again!). I’m not sure that this is the most perfect, wonderful dogpile in baseball history. Wait. I’ve watched it again. This entry was posted in Baseball, University of Virginia and tagged college baseball, College World Series, University of Virginia, winning and losing by Jackie, The Baseball Bloggess. Bookmark the permalink. Celebrating great plays and an exciting, so unexpected championship can never be called gloating. Thanks for the opportunity to revisit this wonderful event. Reading this made me smile. I’m pretty sure that the signal for a touchdown in football came out of this celebratory reaction. Oooh, I hadn’t thought of that … I bet you’re right! I’m pretty sure I did the fist bump to nobody and did a big “YES!” At the end of game 3. Excellent post! Fist bumps are good too … Definitely victory worthy! Thanks! Enjoying a championship isn’t bragging at all, celebrating is what it’s all about. You simply have to take advantage of a situation like this, because you never know when one will come along again. Congrats again to Virginia. I wonder how celebrations happen in Japanese baseball? And Jeffrey Leonard’s one flap down was maybe the south pole to this north pole raised arm consensus?